Why Can't I Get BT Infinity? I'm moving into a new property soon which is served by Cabinet 68, which is enabled for BT Infinity. Every other property on the street is able to get BT Infinifty according to the online checker, including both properties immediately adjacent to it, so it's obviously not a problem related to distance. The property was recently refurbished and split into multiple flats - I'm perhaps wondering if this has caused an issue with the online checker. The staff on the phone were very unhelpful when I rang in. Any idea if anything can be done? 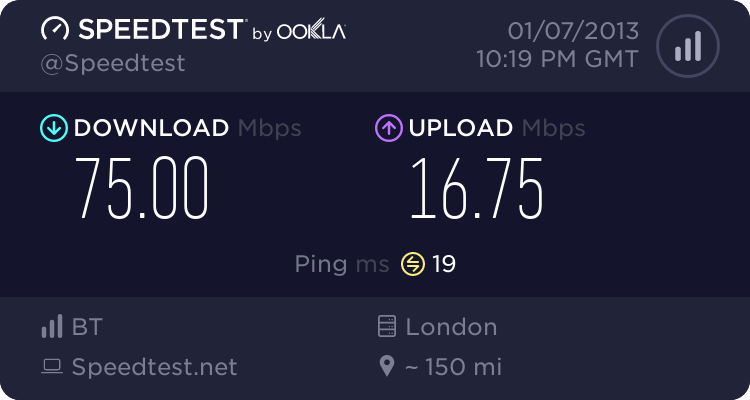 Re: Why Can't I Get BT Infinity? The postcode/address system has probably not updated to the point where BT recognise the property, so computer says no. Once you have managed to get an active telephone line installed things should improve, probably. Do Virgin do flats. I thought not. On the virgin, sometimes, sometimes not. VM have not put there own cable network into flats for a fair few years now. It could that the RDSLAM is at full capacity, in which case you will need to wait for a port to become free or hope a new fibre card is installed due to demand. I don't think that is the case as he's already said other properties in the street can get FTTC. I wonder if the flats have been put on a DACs, do they show on the checker? Depends what you mean by flats. All the 2 storey and 3 storey blocks here in Farnborough and the ones I know in Fleet have ALL got VM cable. For many people it was the only way to get internet, as the distance from the exchange was too far for ADSL (no sync).